Pottery Butter Dish. 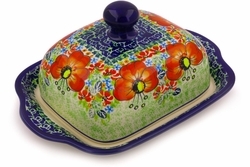 Our Polish pottery butter dish is made of nonporous stoneware. The hand-painted surface is scratch resistant and easy to clean. These handcrafted ceramic butter dishes are an essential piece of kitchenware for any home.